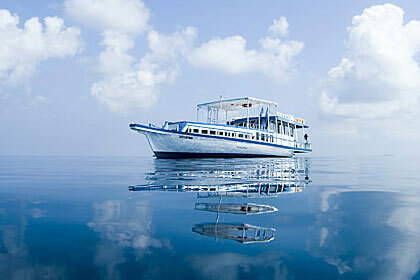 The Maldivian tourism includes an interesting product; the liveaboards. In Maldives such cruising vessels are normally termed a 'safari' even though an African wilderness is the least you will expect in the Maldives. The vessels differ in their designs, size and even the services offered. Some are quite modest yatch-dhoanis, local boats adapted to the cruising needs. Others may have several rooms and offer facilities that are almost like a resort. The food is also diverse. Some boats even boast of restaurants while others have their own menus. The liveaboards offer many activities including diving, excursions to both uninhabited and inhabited islands and fishing trips. A cruise in a liveaboard can be very entertaining. You have the opportunity of visiting many islands and experiencing the local way of life. You also get a chance of a lifetime to dive in many dive sites that are famous throughout the world for their unspoiled beauty. Most liveaboards are offer diving equipment and have qualified instructors.The crew is familiar with the local waters and expert hands navigate you through the beautiful reefs and channels of the Maldives. The sight of the sparkling sea is a marvelous scene. Occasionally, you might see a school of dolphins dancing rhythmically. By night you can relax on the deck gazing at the millions of the stars above you.